I have never seen one nor heard of one. Have you ever seen one in person? I can think of a few problems off hand. Even with steel wheels, are the studs long enough to properly secure the two wheels to the front hub. What kind of fender clearances will be needed to properly turn sharp, left or right. You could take your front wheels, turn the 180* and mount them. Then try turning the steering wheel lock to lock. Will the hub bearings be of adequate load bearing ability to properly handle the dual wheels at highway speeds and turns. During rain or snow, how will you adequately prevent visibility degradation. If you have any photos or links, post them. I think it would be a simple bolt on with steel rims (lug length issue). I am pretty sure the hubs would fail quickly so up grade to Danatrack units. https://turtleexpedition.com/tech-st...bearing-thing/. I will be taking my studded tires of in a few April, they are on steel rims I can see if they will bolt up. Lay a straightedge on the outside of the tire turn lock to lock and see if it clears the fender. Might have to upgrade steering box and pump or just make sure you are moving when you want to turn. If you did upgrade to bigger rim and went with super single that might be better. MrTommy and Randy 4614 like this. Thanks for the input and ideas. I've always had off the wall ideas. I'll probably charge onto it. And if I dont like it put it back. I have it lifted 6 inches. I'll send pics when I get it done. Just be aware that you won't be able to turn. Hopefully you won't ever take it onto the street. I think it should work fine if the fender clears. Not quite like stock but it would be fun to have one. If you do a google search you can find a pic of a 95 or so with duel front wheels at a gas station and military trucks with them. Should not be that bad on soft stuff. Hardball would most likely be a bit of work turning. If that hub holds it should be a great truck in soft sand or mud. Post some pictures when you get er done! Turns out there is a company that sells the adaptors that will convert the front from single to dual wheels. Still, I don't understand why you couldn't just exchange the studs for longer one. I would turn the front wheels around and check the clearance turning lock to lock. With the six inch lift, you may be OK, or you may need to modify the fenders if there is not enough clearance. I would definitely put in the Danatrack units. The steering components will not be able to turn the wheels very well, especially on pavement. It will be an off-road only vehicle. Do not take it onto the road. Thanks all. All your inputs are appreciated. 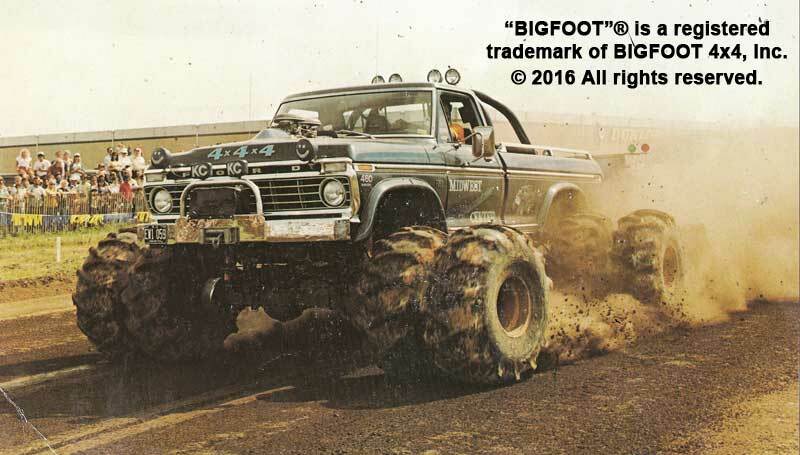 Look for some pictures of Bob Chandler's original BIGFOOT 4x4x4. It's been a long while but I seem to recall that was the setup, duals on front and rear. Yes, here it is. Obviously not a street machine. But if you are looking to crush cars, it might work well. Is this sort of what you have in mind for your truck? The bigfoot trucks are pretty cool . Thanks for the pics. Mine wont be that extreme.